Jupiter is pictured here with its closely orbiting moon Io (not one of the newly discovered moons). The team, led by astronomer Scott Sheppard, first spotted some of the new moons while looking for exceptionally distant objects at the brim of our Solar System, beyond Pluto, using the Blanco 4-meter telescope at the Cerro Tololo Inter-American Observatory in Chile. 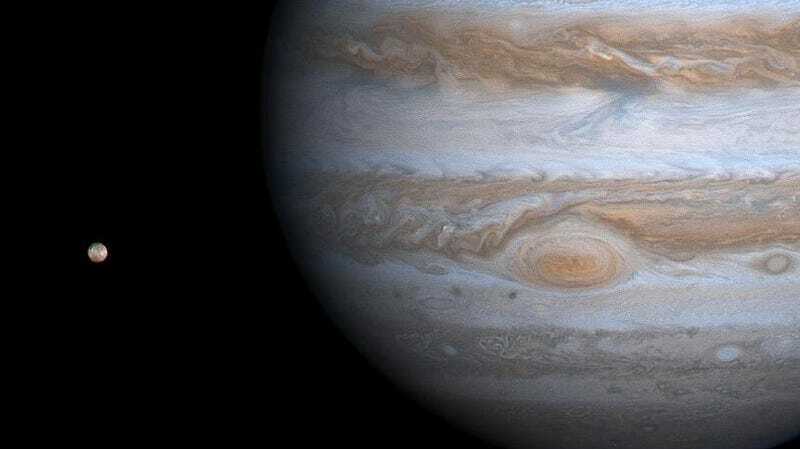 Jupiter just happened to be in their view, and they noticed a handful of new objects near the planet, between just one and four kilometers in diameter. After tracking the objects’ orbits for about a year with other Chilean telescopes, in addition to some in Arizona and Hawaii, the scientists were able to confirm them as moons. Alycia Weinberger, an astronomer also from the Carnegie who wasn’t involved in the new discovery, agrees with Sheppard.